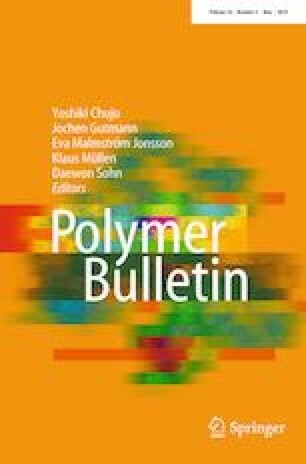 Biodegradation of methacrylic acid and starch graft copolymers was investigated for the first time in this manuscript. Synthesized copolymer was characterized by 1H nuclear magnetic resonance spectroscopy (NMR), Fourier transformed infrared spectroscopy (FTIR), scanning electron microscopy (SEM) and elemental analysis. Copolymers with different percentage of grafting, G (%), were buried in three different types of soil. Biodegradation was monitored by measuring mass loss of the samples and using FTIR and SEM. The highest weight loss was in soil for the orchid growth (all samples had biodegradation higher than 89%), followed by soil for the cactus growth (mass loss higher than 70%) and soil rich in humus where some of the samples had biodegradation rate near or less than 50%. The correlation between G (%) and percent of weight loss after biodegradation was not significant in any types of soil. FTIR and SEM showed that after biodegradation, samples still contained both building components. Respiration test showed higher O2 consumption and CO2 production comparing to polystyrene which confirmed biodegradability of the accessible starch in copolymer. Based on the obtained results, degradation mechanism is proposed. First step is biodegradation of easily accessible starch followed by dissolution of the poly(methacrylic acid). This mechanism confirmed that biodegradation depends not only on the percentage of grafting, but also on molecular packaging, chains arrangement and the number and types of microorganisms present in the specific types of soils. The online version of this article ( https://doi.org/10.1007/s00289-018-2484-x) contains supplementary material, which is available to authorized users. This work was supported by the Ministry of Education, Science and Technological Development of the Republic of Serbia through funding for Projects OI 172001 and III 43004.